You see something enough times and your mind starts getting its own ideas. You don’t want your mind to take over. You want your brain to stay firmly planted in the present, in reality; you hate it when it wanders off into a mind of its own and becomes that mind. You want it to plainly process the information your eyes pass on and for it to focus on the task at hand. You want to drive safely. You brain tells itself to stay disciplined and not be distracted. And yet your head turns. Your mind wanders. It points your eyes at that food truck that you have seen at least fifty eight times. 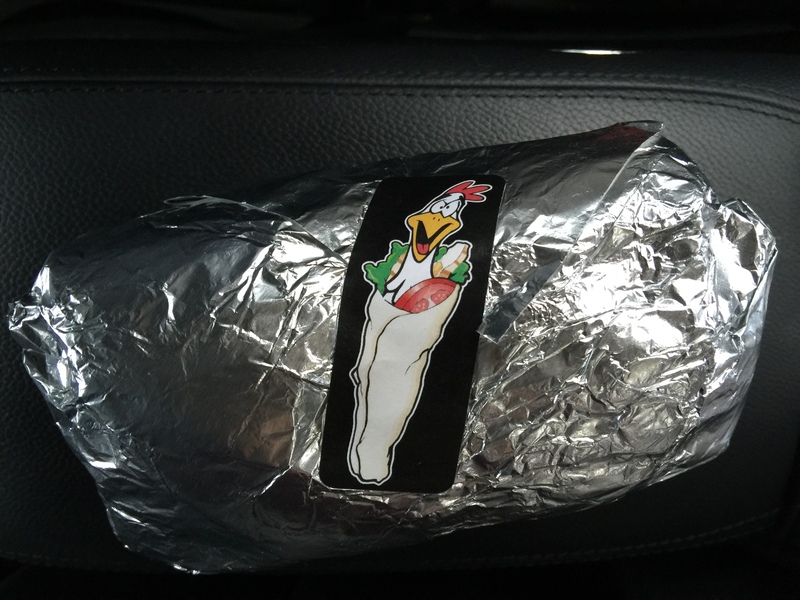 Eat Chicken Wraps…Thank you. I will. And I have, if that interests you. I haven’t eaten your chicken wraps but I have had some from the Cazba trailer not three minutes from where you park yourself. 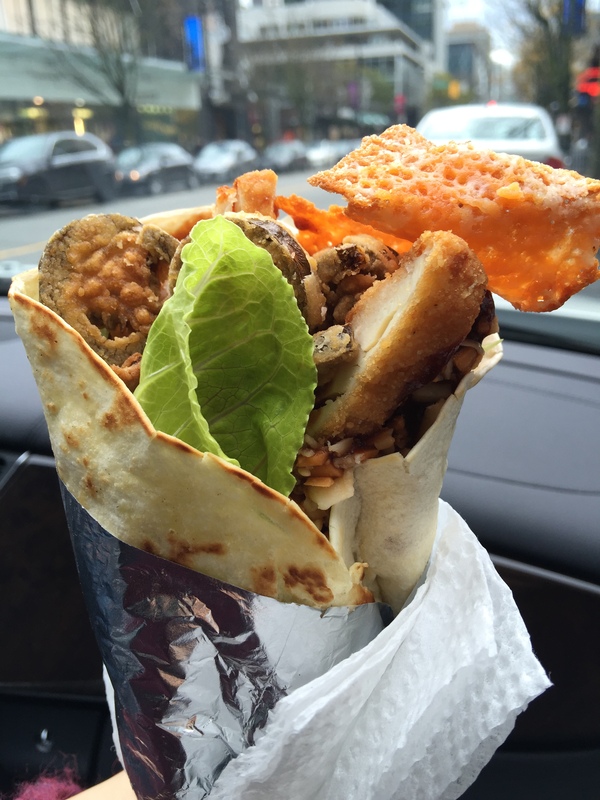 I, no, my mind -not my brain – sometimes associate you with a donair, a shawarma, and every other name they assign to a stuffed-pita. Sometimes not. Sometimes I see the Chinese words tattooed on your body and imagine a Beijing Duck-like chicken wrap. Sometimes I look at that comical chicken on your body and think Bugs Bunny. My brain remembers. My brain flagged. For the briefest of moments, my brain broke through my wandering mind and planted a seed. Hunger. My mind responded. I stopped the car. I jaywalked. I cut in front of the two suits trying to make up their minds on what they wanted to order. I ordered a buffalo chicken wrap and an al pastor wrap. Then the focus went. 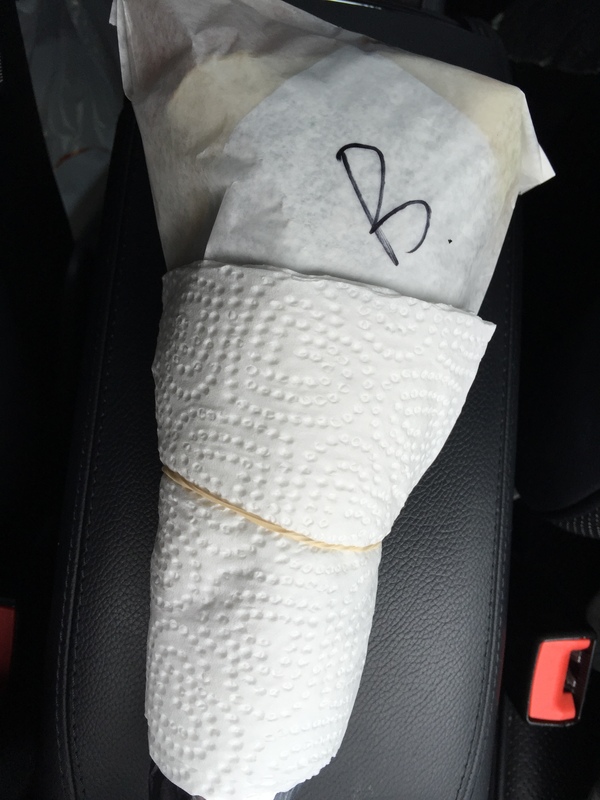 My mind wandered…until the lady from the truck called out for my wraps to be picked up. I took a bite into each of the wraps. My mind stopped wandering. My brain reverted to its purpose-driven self. It sensed and it felt. It lingered and it revelled. High as a kite it was. Neurons firing from every which way, piling on the dopamine like they had just won the lottery. Juicy, crunchy, ice cold romaine. Crunchier, equally ice cold, and extra dry cheese crisp. Super crispy, gone-cold, spicy-hot fried jalapeños. Mega crispy, also-gone-cold, not-quite-juicy deep-fried white chicken. Doughy wrap. Spicy BBQ sauce. Should not have combined to create anything close to being enjoyable but did. Like hell it did. Like narcotics it did. Like I didn’t want to stop eating the thing till it disappeared it did. Like it did my mind. And ditto said my brain. Also liked the al pastor did my brain. And the mind agreed. My mind reminded the brain that the al pastor was far from authentic. My mind told the brain that it matters not. 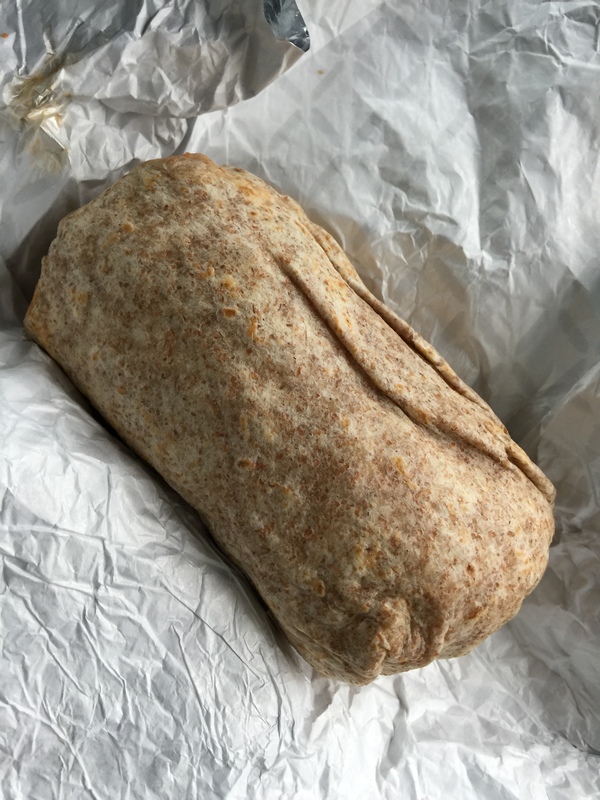 My brain told my mind to shut up and enjoy the inauthentic wrap. Chicken. Pineapple. A bunch of juice-dripping vegs and aromatics that were supposed to play the part of authentic Mexican flavour-bit-players. Mexican flavours were not achieved. Crazy-good, Mexico-produced-pure-psychodelic-like sensations were. Every bite tasted like an explosion of freshness. Every bite was a trip. Crunch. Sweet. Toothsome, flavoursome, crunch, sweet, chicken, crunch, crunch, juicy, crispy, sweet, crunch. Did I just finish the wrap? I did. I need more. 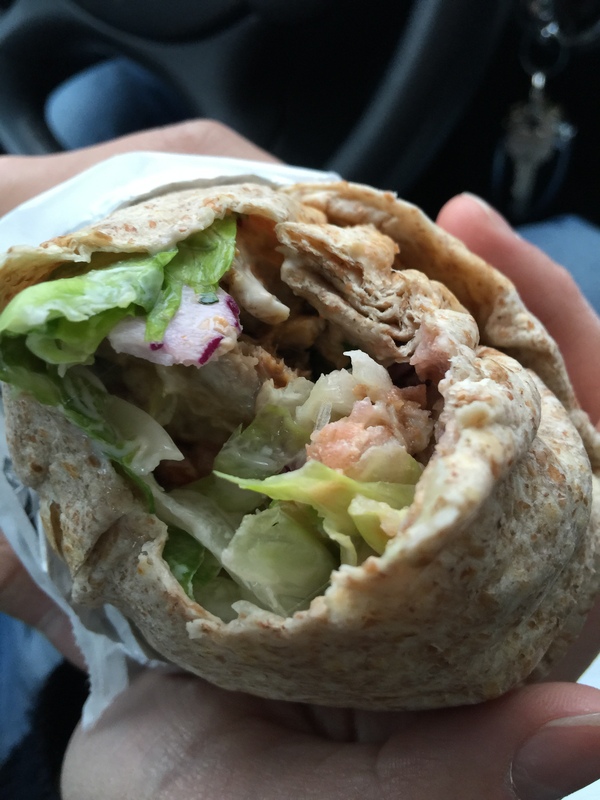 I will…Eat chicken wraps. The brain remembers. The mind knows.